A step away from the Jetsons and the futuristic dreams of humanoid drones washing the dishes and mopping the floors, robot vacuum cleaners have for a number of years sat on the cusp of practicality and effectiveness with the iRobot Roomba 780 entering the fray as a candidate for the leading solution to at least one tiresome household chore. 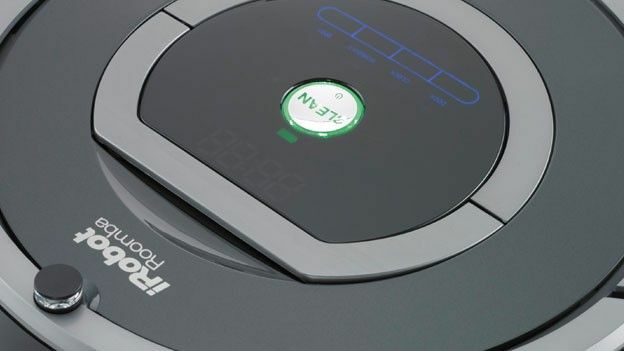 Functional, feature packed and well-designed, iRobot's latest addition to the robot vacuum cleaner market ticks all the key boxes on paper with its performance living up to expectation, for the most part. Like its rivals, the iRobot Roomba 780 has adopted a rounded form with the self-propelled floor cleaner lining up with a circumference considerably larger than that of a dinner plate. With little to talk about in terms of aesthetics, the Roomba offers a certain degree of the futuristic air associated with robot vacuum cleaners while maintaining the clinical form or a product designed for hygienic reasons and cleaning purposes. Compact enough to wriggle its way under most dressers, beds, sofas and other freestanding furniture that proves a pain to clean, iRobot's latest vacuum cleaner boasts an intuitive top-mounted touch button control system making navigating through the unit's array of features quick, less fiddly than with small physical buttons and, for the most part, simple. Packed full of party tricks the iRobot Roomba 780 plays host to a series of sensors ensuring it slows before using its spring loaded bumper to sense the edges of items and change direction. While this is usually cause for little concern, on more than one occasion low freestanding objects with little weight have been knocked over while testing. Featuring an built-in timer, you can schedule the Roomba to clean at a desired time meaning you never need be surrounded by its insatiable motor noise. It takes some getting used to, but the scheduling system quickly becomes easy to set, taking even more hassle out of cleaning. For those looking to do virtually nothing in the way of vacuuming, a packaged remote control allows for responsive manipulation of the droid. More than capable of giving your home a quick spruce, the iRobot Roomba 780 will not be able to fully replace the manual vacuum cleaner in many homes, at times struggling with loose carpets, corners and those hard to reach areas that are smaller than a crate. Where the Roomba comes into its own, however, is areas of the home oft overlooked by the lazy, rushed household cleaner. Under sofas, beds and bookcases that have a minimum clearance higher than the device's compact form are all in for a welcome clean with the wandering robot happily disappearing under the furniture only to reappear at random intervals with a selection of long lost items residing in its ample tray. While the dirt tray will need emptying after every one or two complete sweeps of the home (depending on size and just how grubby the place is to begin with), this process proves to be no strenuous or dust cloud-creating task with the dirt collector clicking in and out from the rear of the unit with ease. Far from the finished article the, iRobot Roomba 780 is, however, an all-round good performer, capable of cleaning a variety of surface types with ease and readily on hand to snap up any unsightly debris smaller than a ping pong ball. Fast, thorough and easy to use the Roomba 780's biggest downfall is its near £499 price tag, whilst it does take much of the hassle out of cleaning, for the price, buying a regular manually operated vacuum and putting in a little elbow grease would certainly save the pennies.